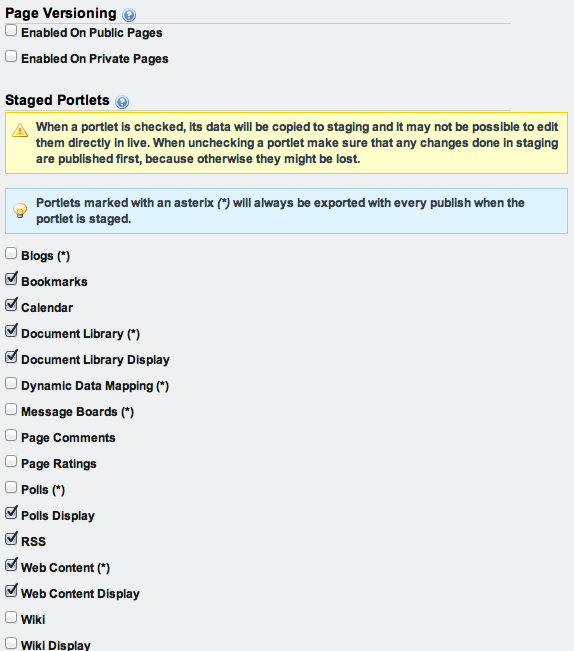 Staging is an important feature of Liferay WCM. The concept of staging is a simple one: you can modify your site behind the scenes and then publish all your updates in one shot. You don’t want users seeing your web site change before their eyes as you’re modifying it, do you? Liferay’s staging environment allows you to make changes to your site in a specialized staging area. When you’re finished, you can publish all your site changes at once. Liferay provides site administrators with two different ways to set up staging: Local Live and Remote Live. With Local Live staging, both your staging environment and your live environment are hosted on the same server. When Local Live staging is enabled for a site, a clone of the site is created containing copies of all of the site’s existing pages. Portlet data is also copied, depending on which portlets are selected when staging is enabled. The cloned site becomes the staging environment and the original site becomes the live environment. When Remote Live staging is enabled for a site, a connection is established between the current site and another site on a remote Liferay server. The remote site becomes the live environment and the current site becomes the staging environment–an instance of Liferay Portal used solely for staging. Content creators can use the staging server to make their changes while the live server handles the incoming user traffic. When changes to the site are ready to be published, they are pushed over the network to the remote live server. Whether you enable Local Live or Remote Live staging, the interface for managing and publishing staged pages is the same. So when should you use Local Live staging and when should you use Remote Live Staging? Local Live staging allows you to publish site changes very quickly, since the staged and live environments are on the same server. It’s also easier to switch between the staged and live environments using Local Live staging. However, since the staged content is stored in the same database as the production content, the content isn’t as well protected or backed up as with Remote Live staging. Also, you can’t install new versions of portlets for testing purposes in a Local Live staging environment since only one version of a portlet can be installed at any given time on a single Liferay server. With Remote Live staging, your staging and live environments are hosted on separate servers. This allows you to deploy new versions of portlets and content to your staging environment without worrying about interfering with your live environment. With Remote Live staging, you can also use one Liferay instance as the staging server for multiple production servers. However, publishing is slower with Remote Live than with Local Live since data needs to be transferred over a network. And, of course, you need more hardware to run a separate staging server. Liferay 6.1 added a feature to staging called Page Versioning. This feature works with both Local Live and Remote Live staging and allows site administrators to create multiple variations of staged pages. This allows to several different versions of sites and pages to be developed at the same time. Variations can be created, merged, and published using a Git-like versioning system. Let’s jump in to see how to use staging. Site administrators can enable Staging for a site via the Site Settings UI. To reach this interface via the Control Panel, select a site in the context menu selector, click on Site Settings in the Control Panel menu, then click on Staging at the left. Under Staging Type, select either Local Live or Remote Live and additional options appear. Staging allows changes to be made in a staging environment so that work can be reviewed, possibly using a workflow, before it’s published to a live site. Enabling Local Live staging is easy. Just select Local Live and decide whether you’d like to enable page versioning. You can enable page versioning on a site’s public pages, private pages, both, or neither. Page versioning allows you to work in parallel on different versions of pages and maintains a history of all page modifications. We discuss page versioning in more detail below. Remember to restart both Liferay servers after making these portal properties updates. After restarting, log back in to your local Liferay portal instance as a site administrator. Then navigate to the Control Panel and choose a site in the context menu selector. Then click on Site Settings in the Control Panel menu and then on Staging in the menu at the left. Select Remote Live under Staging Type and additional options appear. Figure 3.20: After your remote Liferay server and local Liferay server have been configured to communicate with each other, you have to specify a few Remote Live connection settings. 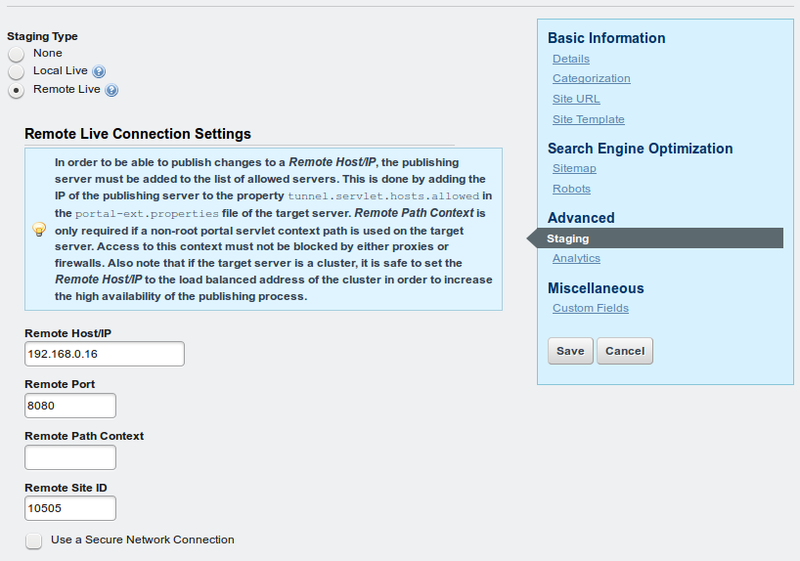 First, enter your remote Liferay server’s IP address into the Remote Host/IP field. If the remote Liferay server is a cluster, you can set the Remote Host/IP to the load balanced IP address of the cluster in order to increase the availability of the publishing process. Next, enter the port on which the remote Liferay instance is running into the Remote Port field. You only need to enter a Remote Path Context if a non-root portal servlet context is being used on the remote Liferay server. Finally, enter the site ID of the site on the remote Liferay server that will be used for the Live environment. If a site hasn’t already been prepared for you on the remote Liferay server, you can log in to the remote Liferay server and create a new blank site. After the site has been created, note the site ID so you can enter it into the Remote Site ID field on your local Liferay server. You can find any site’s ID by selecting Actions → Edit next to the site’s name on the Sites page of the Control Panel. Finally, check the Use a Secure Network Connection field to secure the publication of pages from your local (staging) Liferay server to your remote (live) Liferay server. That’s all you need to do to enable Remote Live Staging! However, when a user attempts to publish changes from the local (staging) server to the remote (live) server, Liferay passes the user’s credentials to the remote server to perform a permission check. In order for a publishing operation to succeed, the operation must be performed by a user that has identical credentials and permissions on both the local (staging) and the remote (live) server. This is true regardless of whether the user attempts to publish the changes immediately or attempts to schedule the publication for later. If only a few users should have permission to publish changes from staging to production, it’s easy enough to create a few user accounts on the remote server that match a selected few on the local server. However, the more user accounts that you have to create, the more tedious this job becomes and the more likely you are to make a mistake. And you not only have to create identical user accounts, you also have to ensure that these users have identical permissions. For this reason, we recommend that you use LDAP to copy selected user accounts from your local (staging) Liferay server to your remote (live) Liferay server. Liferay’s Virtual LDAP Server application (EE-only), available on Liferay Marketplace, makes this easy. Let’s create a Local Live staging environment for Nose-ster’s home page. Before we begin, let’s add a new page. Click Add → Page from the toolbar in the default site and name the new page News and Events. Next, click the View Pages button to navigate to the pages. Then add the Alerts and Announcements portlets to the News and Events page. When you activate staging Local Live staging, Liferay creates a clone of your site. This clone became the staging environment. Because of this, we recommend only activating staging on new, clean sites. Having a few pages and some portlets (like those of the example site we’ve created) is no big deal. However, if you have already created a large amount of content you might not be able to enable staging on that site. Also, if you intend to use page versioning to track the history of updates to your site, we recommend that you enable it as early as possible, before your site has many pages and lots of content. Your site’s update history won’t be saved until you enable page versioning. Page versioning requires staging (either Local Live or Remote Live) to be enabled. Now we’re ready to activate staging for this site. Go to the Control Panel then to Site Settings and select Staging from under the Advanced heading. We’ll assume we don’t have a separate staging server so we’ll select the Local Live staging type. If you do have a separate server to use for staging, follow the instructions in the previous section for configuring it and your local server for remote staging. Either way, once you make a selection (either Local Live or Remote Live), more options become available for page versioning and staged portlets. Enabling page versioning for a site allows site administrators to work in parallel on multiple versions of the site’s pages. Page versioning also maintains a history of all updates to the site from the time page versioning was enabled. Site administrators can revert to a previous version of the site at any time. This flexibility is very important in cases where a mistake is found and it’s important to quickly publish a fix. If you’re following the Nose-ster example, check Enabled On Public Pages to enable page versioning for the Nose-ste site and then click Save. Figure 3.21: You can decide to use versioning and choose what content should be staged. Before you activate staging, you can choose which portlets’ data should be copied to staging. We’ll cover many of the collaboration portlets listed under the Staged Portlets heading when we come to chapter 8. For now, you just need to be aware that you can enable or disable staging for any of these portlets. Why might you want to enable staging for some portlet types but not others? In the case of collaborative portlets, you probably don’t want to enable staging since such portlets are designed for user interaction. If their content were staged, you’d have to manually publish your site whenever somebody posted a message on the message boards to make that message appear on the live site. Generally, you’ll want web content to be staged because end users aren’t creating that kind of content–web content is the stuff you publish to your site. But portlets like the Message Boards or Wiki would likely benefit from not being staged. Notice which portlets are marked for staging by default: if you enable staging and accept the defaults, staging is not enabled for the collaborative portlets. After enabling staging (either Local Live or Remote Live) for a site, you’ll notice a colored bar with some new menus just below the Dockbar when you navigate to the site. These new menus help us manage staged pages. You’ll also notice that most of your page management options have been removed, because now you can’t directly edit live pages. You now must use the staging environment to make changes. Click on Staging to view the staged area. Your management options are restored and you can access some new options related to staging. If you’re following along with the Nose-ster example, navigate back to the News and Events page and click on Staging to get your page editing capabilities back. Figure 3.22: You can see the new bar staging adds to the top of your screen. Add the Calendar portlet and then click on Live from the Dockbar. Notice that the Calendar portlet isn’t there. That’s because you’ve staged a change to the page but haven’t published that change yet to the live site. Go back to the staged page and look at the options you have available. From here you can Undo changes, view a History of changes, Mark as Ready for Publication and Manage Page Variations. Undo/Redo: allows you to step back/forward through recent changes to a page, which can save you the time of manually adding or removing portlets if you make a mistake. History: shows you the list of revisions of the page, based on publication dates. You can go to any change in the revision history and see how the pages looked at that point. Manage Page Variations: allows you to work in parallel on multiple versions of a staged page. We will explain this later. After you’re done making changes to the staged page, click the Mark as Ready for Publication button. The status of the page changes from Draft to Ready for Publication and any changes you’ve made can be published to the Live Site. When you publish a page to live, only the version which was Marked as Ready for Publication is published. The dropdown next to the Staging link at the top gives you the option to Publish to Live Now or Schedule Publication to Live. Publish to Live Now: immediately pushes any changes to the Live Site. Schedule Publication to Live: lets you set a specific date to publish or to set up recurring publishing. You could use this, for example, to publish all changes made during the week every Monday morning without any further intervention. Click on Mark as Ready for Publication and then Publish to Live Now to publish your Calendar portlet to the live site. Content publication can be also controlled using staging. Calendar events are staged by default (this can be changed in Staging Configuration). If you create an event in the staged site, it isn’t visible in the live site until you publish it to the live site following the same steps you just performed (you can select which types of content are published when you publish to the live site). If workflow is enabled for Calendar Events, the event needs to go through the workflow process before it can be published to the live site. Figure 3.23: Ready to publish to the live site. One of the most powerful features of staging is page variations. Let’s see how to use them to create multiple different variations of your site’s pages for different purposes. Let’s say you’re working on a product-oriented site where you’ll have several major changes to a page or a set of pages over a short period of time. Also you need to be working on multiple versions of the site at the same time to ensure everything has been properly reviewed before it goes live. With staging in Liferay 6.1 you can do this using Page Variations. For example, you can create several page variations, enabling the marketing team to give your site a completely different look and feel for Christmas. At the same time, the product management team can work on a different version that will be published the day after Christmas for the launching of a new product. Additionally, the product management team is considering two different ideas for the home page of the site, so they can create several page variations of the home page inside their product launch site. Variations only affect pages and not the content, which means all the existing content in your staging site is shared by all your variations. In different site page variations you can have different logos, different look and feel for your pages, different applications on these pages, different configuration of these applications and even different pages. One page can exist in just one site page variation or in several of them. By default, we only have one site page variation which is called Main Variation. To create a new one, use the dropdown next to the Staging link and click on Manage Site Pages Variations. This brings you to a list of the existing site page variations for your site. Click Add Site Pages Variation to create a new one. From the Add Site Pages Variation screen, you can set a Name, Description and also set your new variation to copy the content from an existing variation. There are several options to choose in this selector. Any existing Site Pages Variation: creates a new site page variation that contains only the last version of all the pages that exist in this variation. The current variation must be marked as ready for publication. All Site Pages Variation: creates a new variation that contains the last version marked as ready for publication from any single page existing in any other variation. None: creates a new, empty variation. You are also able to rename any variation. For example, edit the Main Variation and change its name to something that makes more sense in your site, such as Basic, Master, Regular and create a variation for Christmas. You can switch between different variations by clicking on them from the staging menu bar. It’s also possible to set permissions on each variation, so certain users have access to manage some, but not all variations. You can now go to the home page of your Christmas variation and change the logo, apply a new theme, move portlets around, change the order of the pages and configure different portlets. The other variations won’t be affected. You can even delete existing pages or add new ones (remember to Mark as Ready for Publication when you are finished with your changes). When you delete a page, it is deleted only in the current variation. The same happens when you add a new page. If you try to access a page which was deleted in the current variation, Liferay informs you this page is not enabled in this variation and you must enable it. To enable it, navigate to the Manage → Site Pages screen. Here all the existing pages for all the variations are shown in a tree. Pages not enabled for the current variation are shown in a lighter color. To publish a variation to the live site, click on Publish to Live now in the dropdown next to the variation name. Publications can also be scheduled independently for different variations. For example, you could have a variation called Mondays which is published to the live site every Monday and another one called Day 1 which is published to the live site every first day of each month. You can also have variations for a single page inside a site page variation, which allows you to work in parallel in different versions of a page. For example, you might work on two different proposals for the design of the home page for the Christmas variation. These page variations only exist inside a site Page variation. To create a new page variation, click Manage Page Variations on the staging toolbar. This brings you to a list of existing page variations for the current page (by default, there is only one called Main Variation). You can create more or rename the existing one. You can switch between different page variations using the toolbar containing the page variations below the site pages variations toolbar. When you decide which page variation should be published, mark it as Ready for Publication. Only one page variation can be marked as ready for publication and that is the one that gets published to the live site. 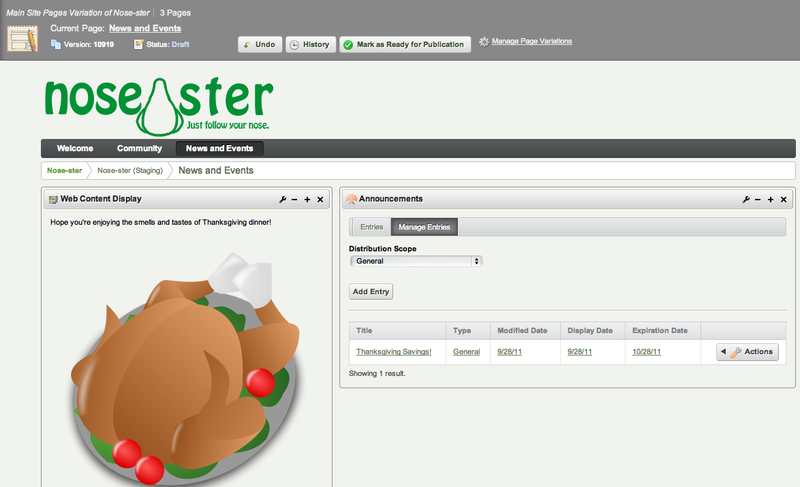 For example, we could create a page variation called Thanksgiving for the News and Events page inside of the Christmas variation and another one called Christmas Day to display different content on those particular days. 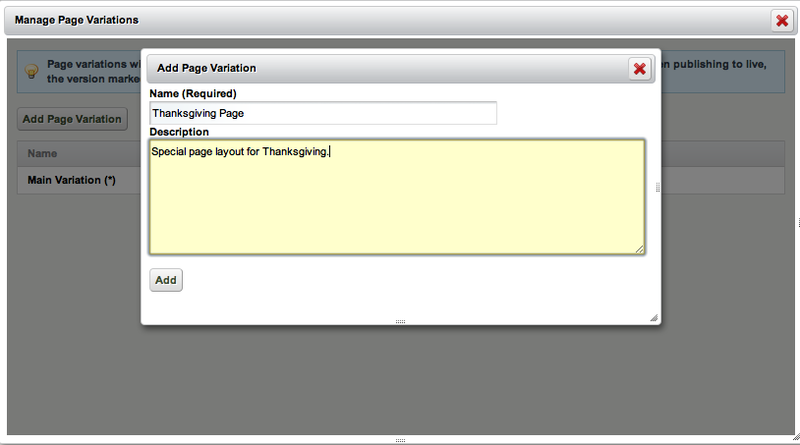 Figure 3.25: The Thanksgiving Page Variation. New pages that don’t exist in the base Variation, will be added. If a page exists in both Site Pages variations, and at least one version of the page was marked as ready for publication, then the latest version marked as ready will be added as a new Page Variation in the target page of the base Variation. (Note that older versions or page variations not marked as ready for publication won’t be copied. However, merge can be executed as many times as needed and will create the needed pages variations in the appropriate page of the base Site Pages Variation). Merging does not affect content nor will overwrite anything in the base Variation, it will just add more versions, pages and page variations as needed. Let’s finish our discussion of staging by outlining a few more features. You can enable staging on an individual site basis, depending on your needs. This makes it easy to put strict controls in place for your public web site, while opening things up for individual sites that don’t need such strict controls. Liferay’s staging environment is extremely easy to use and makes maintaining a content-rich web site a snap. Liferay 6.0 introduced a new feature to the permissions system called teams. Let’s examine teams next.